Posted On December 18, 2013 by Team iCynosure. With a little princess who wants to explore all things that are rightfully not supposed to be available to her, it is quite a task to save not only my wallet and but also my your electronic devices. Be it my laptop, the mobile phone and even my camera I have to ensure that they are far far away from her reach. Well, I was just a bit delayed in my understanding the curious mind of a 24-month-old. The things that she is truly capable of doing without any help from anyone who in his right mind will lend her a helping hand for all the craziness she eludes. One day I overlooked the fact that my laptop was sitting pretty on my bed after I worked on a creative assignment, yes I have the privilege of working from home courtesy my boss whom I call Superman. Oh so back to the laptop, when pretty princess saw it and was finally able to have a way with the electronic piece she had been eyeing forever, all hell broke loose. Dearest husband, instead of stopping her had the nerve to go rampant clicking numerous pictures of her for me to enjoy at a later time. However, I choose to look at the brighter side of this misadventure, it was finally time to buy a lovely tablet. After numerous rounds of the electronics store, I set my eyes firmly on the new edition piece. I was so happy exploring and adjusting the working of the tablet when I accidentally dropped it while trying to hold it with one hand. But I was sure, it would be safe as the height wasn't even two feet. But my bad luck preceded me and the tablet screen hit the leg of the sofa and shattered. In a matter of seconds, I experienced emotions as varied as ignorance, carelessness to horror, anger, sadness and finally resignation. Finally, after loads of inquiries with the brand customer care, I didn't know what to do next. The brand service centre offered a replacement at a horrible INR 15k while the local shop offered a replacement at INR 7k. I opted for the local service shop and with INR 7k poorer I was given the tablet in about 2 week's time. As soon as I received I was so glad, it looked as good as new. However, the moment I started using it, I realized that not only the screen was shaky but the touch-response was slower as well. Phew.... so now the tablet is sitting pretty in the study and is used once in a while by the princess who is all exploring things. So what will I use a tablet for? I'd use a tablet as my morning newspaper while enjoying a cuppa without having to worry about turning the huge pages or looking for the news articles amongst all the adverts. I'd use a tablet as my notebook, jotting down my ideas and thoughts. The full-size keyboard available when you need it and otherwise hidden is a boon in disguise. I'd use a tablet throughout the day for web-browsing as it is a fantastic experience, with great navigation, zoom options and even supports various applications. I'd use a tablet for entertainment when I'm bored. Be it watching movies or listening to music or even playing games - a tablet is available, convenient to carry around and the battery lasts almost twice as much as a laptop. I'd use a tablet as my office on the run.... never miss an important mail, be prompt and always be connected no matter where I am. I'd use a tablet as my best friend who I speak to, smile at while taking selfies and videos. Does a tablet work for me? Yes! most definitely, but with some limitations. Being technologically challenged, what I'd like a Tablet to be is a one-stop solution that can completely replace my laptop. It needs to be a hub for running all types of software, it needs to ensure ease of accessing information stored on other devices, it should be flexible to allow linking of an external keyboard and it should, of course, offer flexibility of modes. Having scanned the tablet market only one brand comes close to delivering few of the desired specifics, it's the Lenovo Yoga Tablet which promises users a #BetterWay. The feature that I think would impact user experience is the multi-mode posture of the Lenovo Yoga Tablet providing flexibility, convenience and above all comfort for its users. 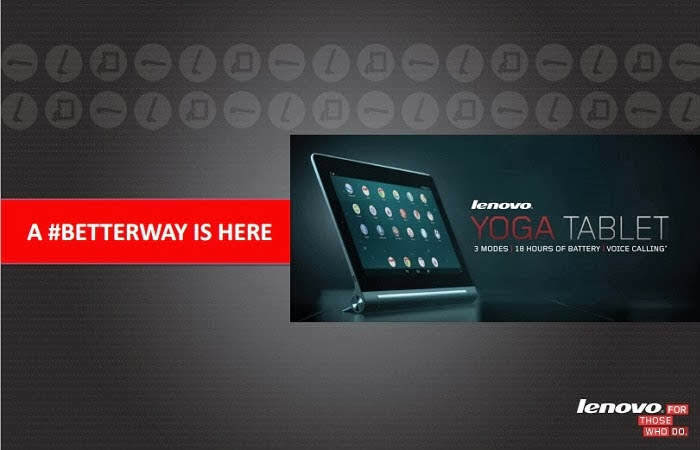 Have you heard about the Lenovo Yoga Tablet? Tried it? Leave me your comments. Should I get one for myself?